Boutique / On Health / Get Your Weight Back on Track, and WIN Cash! Get Your Weight Back on Track, and WIN Cash! By request, Balaboostas is featuring their 3rd Weight Loss Competition this year! If you want to work off those extra pounds that seem to pile up during Chagim, or in the winter months, then this might be perfect for you! 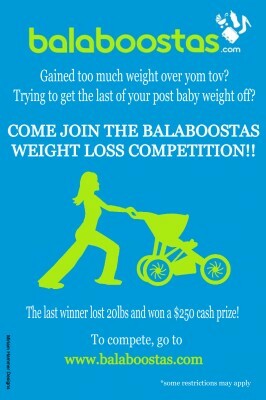 Come join the Balaboostas Weight Loss Competition, where other women like you compete for a CASH prize and shed those pounds at the same time. Sounds too good to be true? It’s not! The last Winner won a total of $250 cash prize and 20lbs! This round, the cash price is the same and may climb. Closing date is tonight at midnight, so if you would like to join, this is your last chance. (If you cannot join yet due to the power outage caused by the hurricane comment here we will consider another few day extension). Read here for terms. Shout out to past competitors: please share your success stories! 🙂 Good luck to all the contestants thus far.